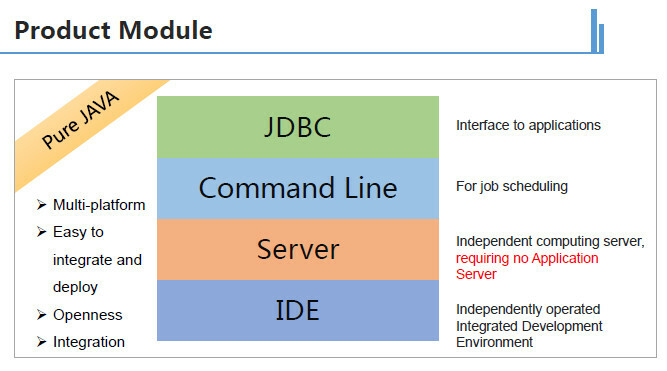 esProc comprises four parts: IDE, JDBC, Command Line, and Server. It can run independently in environments with JDK1.6 and above across platforms, without relying on other servers or middle wares. The visualized esProc IDE (Integrated Development Environment) is a desktop application for script design, running, debug, and other operations. Users can also use it to design diagrams and charts. It supports writing grid-style code. With parameters and macros, it can perform batch processing. It supports immediate execution model, meaning the current step will be executed automatically with the result displayed instantly while the scripting is on the way. esProc JDBC exists in the form of JARs. It is the interface for esProc to be called by applications. It is the standard JDBC Driver, adopting the same calling method as the one for the stored procedure of normal databases, i.e. JDBC URL\ ResultSet. It can be directly integrated into reporting tools and JAVA applications as the data source in computing tasks involving complex algorithms or cross-database computations, and requiring a high performance. esProc Command Line is a command file for batch processing of pure text files, usually ended with cmd\sh. It allows the inbuilt scheduling function of the operating system to execute esProc computational task at a fixed time. It also allows users to execute the script manually at the Command Line window. Through the command line users can implement an automatic scheduling of a hardcoded ETL task, and launch a data management task with parameters manually. esProc Server is an independent computing service software for multi-node parallel computing. The nodes will cooperate to execute read/retrieval and computational tasks based on HDFS files, database files, and external files. The server can act as the computing middleware to alleviate the workload of the database. Using external memory computing, it can optimize database management. esProc Server requires at least a Gigabit LAN.